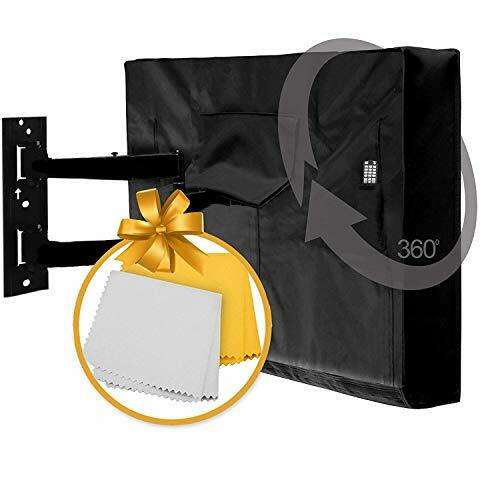 Outdoor TV Cover 50" - 52" - WITH BOTTOM COVER - The BEST Quality Weatherproof and Dust-proof Material with FREE Microfiber Cloth. Protect Your TV Now! Our TV Cover measures 52.5 x 33 x 5 inches which ensures that your Television is Covered. The openings of our cover has Velcro straps installed, making it durable and built to last for a longer period of time, compared to ones made with zippers. It also has a small pouch for your remote control. It is dust-proof, waterproof, and weatherproof, so you wouldn't have to worry about your TV's condition once our TV cover is in use. ENJOY OUTDOOR ENTERTAINMENT AT ITS FINEST! It is backed by a 3 YEARS warranty BUT we can't guarantee that the price will stay the same, so click now and grab your pair while the price is still low! If you have any questions about this product by Clicks, contact us by completing and submitting the form below. If you are looking for a specif part number, please include it with your message.